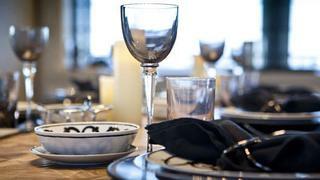 One of the highlights of chartering a luxury superyacht is the fine dining experience. When it comes to cuisine no resort in the world that can match the personalized menu, the superb service and the delightful ambiance of a charter yacht. A mega-yacht is your opportunity to have your own gourmet restaurant with a five-star chef at your beck and call. You will be living the grown-up version of a child in a candy store. Here is some advice to make sure you get the most out of the cuisine during your trip. 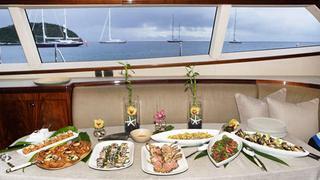 Every chef has specialties, and these should be considered as you choose your yacht. Your charter broker can often provide you with sample menus. Your chef will rely on your preference sheets to create the menus for your superyacht charter. Be absolutely clear about your likes and your dislikes, about what you normally eat and what you are prepared to sample. The preference sheet is also where you should be clear about any dietary restrictions, food allergies, or other factors that affect the meal planning. There’s no need to be shy, charter chefs have seen (and handled) everything from the common no-seafood or vegan diets to complicated sodium or gluten-free regimes. Diabetes? No problem! Kosher? Easy! As long as they are aware of your requirements, you can rest assured that you will serve superb cuisine. Fine cuisine and fine wines go together like yachts and water, so it should be no surprise that a selection of extraordinary wines will be available for your tasting pleasure. If you have specific preferences, such as Italian reds only with dinner or an icy flute of champagne before breakfast, be sure to mention it beforehand. You can, in many cases, select the specific wines by label and vintage so they will be waiting for you on board. How you want to dine is something else to consider. Every charter yacht is fully prepared to provide you with formal dining every night, and this would include fine china and silver, linen and a multi-course meal with wine paring. Depending on where you are chartering, you may want to break this up with more casual meals. Breakfast and lunch are pleasant as alfresco meals, enjoyed more casually on the aft deck or under an umbrella on the upper deck. In some cases, depending on the design of the yacht, you can enjoy a “country-kitchen” meal at a dinette open to the galley, which allows you to interact with the chef and learn a few culinary tricks to take home. The chef does need to sleep so if you expect to have the munchies in the wee hours, let the crew know beforehand. Snacks can be prepared and stored near your suite for 24-hour needs. Your galley crew is prepared to cater to your every desire from a formal dinner to a more casual cocktail party with yummy hors d’oeuvres. There is one rule: this must be planned well beforehand with both the captain and the chef. There is no excuse for arriving back from shore with a handful of friends and expecting to be served. The galleys on many charter yachts often include an unusual selection of equipment that can also bear on your choice of meals. A teppanyaki grill, for example, can serve up everything from stir-fry to Mongolian barbecue. Your yacht is also likely to have a full-sized barbecue grill on deck for everything from steaks to hamburgers. A surprising number of yachts are now equipped with gas-fired pizza ovens, allowing guests to enjoy a freshly baked slice of pizza while enjoying a movie. Your crew may take you to a secluded beach for a picnic ashore. This will be a major production, with tents for shade, beach chairs, a barbecue and picnic tables, and even games ranging from beach golf to volleyball. Don’t forget to mention any special events to your chef as well, because yacht charter crews absolutely love to put on a party. Birthdays, anniversaries, engagements, and business coups all warrant a celebration and where better than on a charter yacht? Your chef and cabin staff can provide entertainment as well and it’s fun to include a “pirate night”, for example, when everyone dresses in costume and the crew decorates the dining table with gold doubloons and treasure chests. You can expect the menu to reflect the event as well, with everything from “castaway stew” to Blackbeard’s brûlée.